We are now in early February and I have no idea where the last few months have gone – and soon we begin lambing. The deadline for Billy’s biography is July – so I think I’d better get a move on! The 2nd Battalion Grenadier Guards leaving Chelsea Barracks for war (12th August 1914). I did manage some research a few weeks ago and took a trip to the Grenadiers’ Regimental Archives in Wellington Barracks. I spent a fascinating hour or two inspecting some wonderful photo albums and reading a selection of diaries. I was made extremely welcome and afterwards felt I had got to know another side of Billy’s life a great deal better. I am so grateful to the Grenadiers for allowing me to use some of these photos in the biography. The one I have included in this post I find particularly moving. What was going through the Grenadiers’ minds as they marched so smartly off the parade ground towards the station where they would ‘entrain’ for Southampton, where the SS Cawdor Castle was waiting to transport them to France? They were professional soldiers, either currently serving or reservists. They were all well-trained, if not all ‘battle’ fit (the reservists could have left the army up to nine years earlier). They believed it was their duty to fight for their country, and the general feeling was that the war would be a short-lived affair and over by Christmas. What none of them would would have imagined was that by the beginning of December 1914, as the the First Battle of Ypres (October/November) drew to a close, only 140 men and 4 officers of the 2nd Battalion would still be alive. One thing I have learned recently through my research is the stupidity of the often repeated comment that the British infantry in WWI were ‘lions led by donkeys’ -particularly if it is applied to junior officers – as it is in ‘Black Adder Goes Forth’. 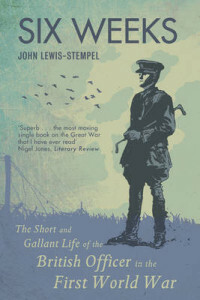 ‘Six Weeks’ by John Lewis-Stempel is an immensely moving book. It shows clearly how these young officers cared for their men and worked tirelessly for them. They led from the front. This is why the average length of survival for one of these young subalterns was indeed six weeks, while many of their men would survive up to three months! All these statistics are deeply shocking – why did any of them have to die? One answer was that they knew there was no choice. If they didn’t fight- then what would have stopped the German Army marching into London? They were certain no treaty with Germany would be worth the paper it was written on. If Germany could tear up the treaty proclaiming Belgium’s neutrality it could tear up any other treaty too! All very thought provoking – but time is pressing ever onwards and I guess I’d better get back to work! 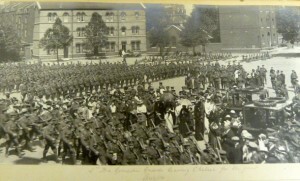 This entry was posted in Biography and tagged bravery, Grenadiers, Wellington Barracks, Ypres. Bookmark the permalink.